Hello again. I am trying so hard to get back into the grove of things after being gone on vacation for the holidays then being sick with this horrible cold/sinus infection. I know so many people who have this cold right now and it is bad. Well on to my card. 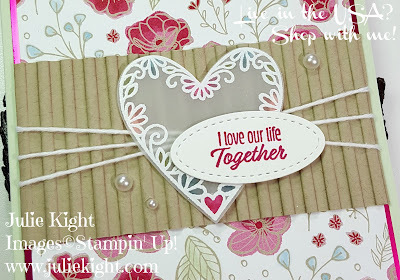 For you today I have a card using the new Meant to Be bundle from the new Stampin' Up! Occasions catalog. 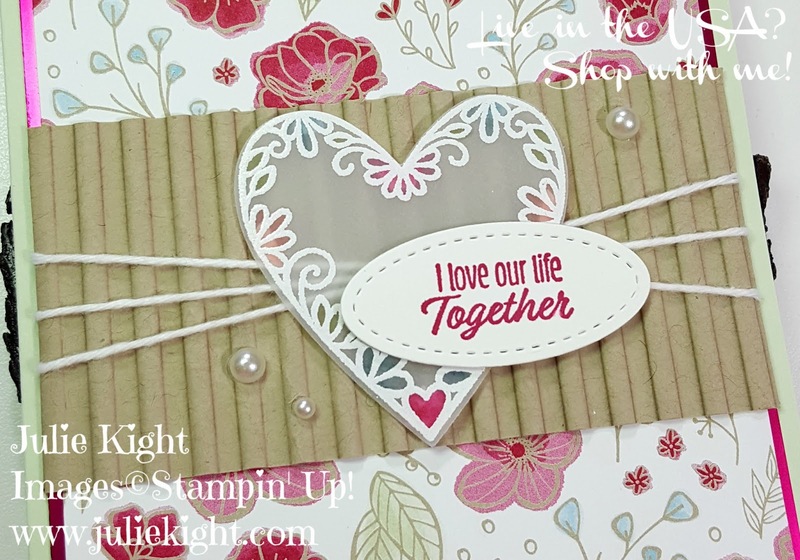 I loved this bundle and DSP (Designer Series Paper) the minute I started looking through the Occasions catalog. The colors they used in this paper are so beautiful together. And you get a lot of neat heart dies in this Thinlits, some of then have a stitched edge too. 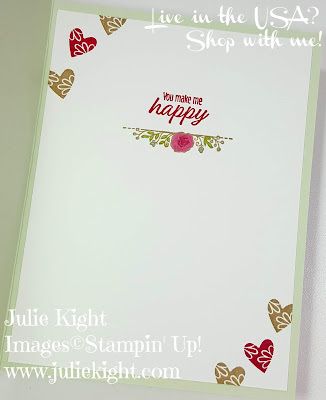 I simple used a piece of vellum to heat emboss on then colored the back of with some Stampin' Blends. I ran a piece of the Crumb Cake cardstock through the Big Shot in the Corrugated Dynamic embossing folder. Then I just wrapped some White Twine around it. I also used some of the new Foil Sheets you can get in the Sale-A-Bration catalog. If you purchase the Meant to Be bundle you could get 8 sheets, 4 of the Lovely Lipstick and 4 of the Grapefruit Grove, for FREE!!! And I have not seen a picture yet that does the Grapefruit Grove any justice.....this foil is so AMAZING. I just did some simple stamping on the inside to carry the theme inside. Don't ever leave the inside of your card "naked". Let the recipient know how much they mean to you. I hope you enjoyed today's project and come back tomorrow for another new project using a Sale-A-Bration stamp set.